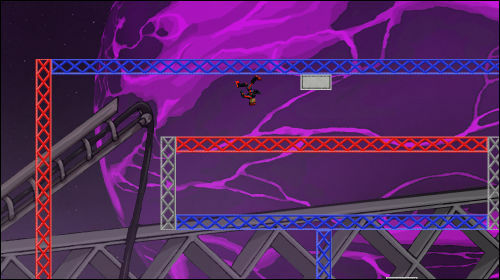 Polarity is a short platformer which uses the concept of magnetism to form traps and puzzes for the players to solve. The cursor or W, A, S and D keys can be used to move your character around, while pressing the space key will cause him to jump. USe the Z key to change the polarity of your suit, and hold the X key to increase it's magnetic field. These abilities are only available once you have acquired the necessary pieces for your suit. There is a healthy number of save points, and the game only consists of five levels.